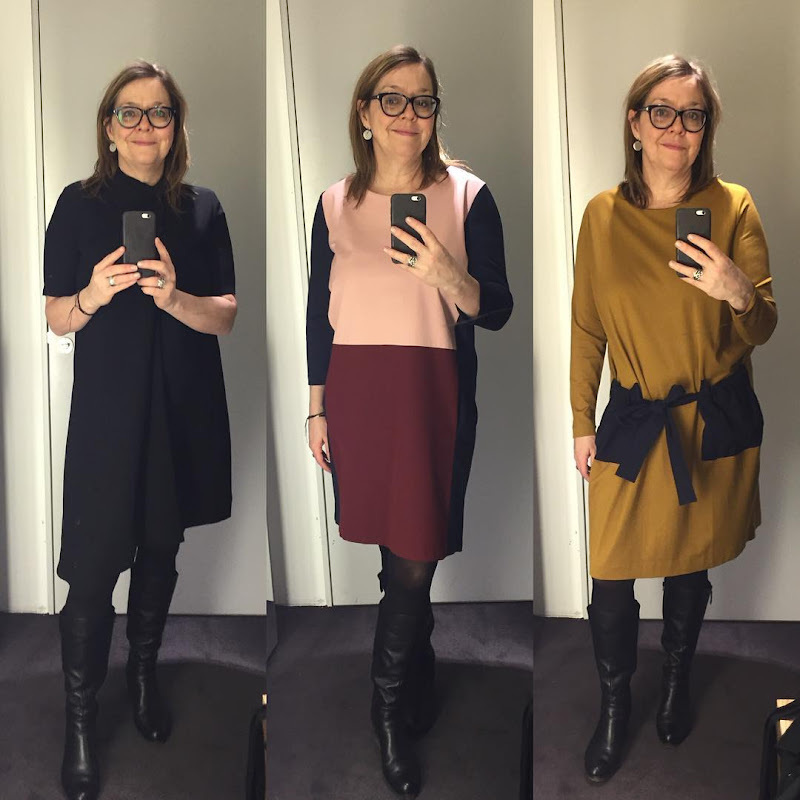 moments of perfect clarity: a new happiness wardrobe or is it the happiness of a new wardrobe? a new happiness wardrobe or is it the happiness of a new wardrobe? i did not buy all these dresses, but i wanted to. i do have some restraint. but at the same time, i am working in the more dressed-up world of shipping again and i needed some new work clothes. my old shipping wardrobe had been hanging in the closet for ages and was pretty out-of-date and just didn't feel like me anymore. i'm a different person now than i was then. and this person needed some new clothes. i've been drawn to navy blue for awhile now, i think it's since i picked navy blue glasses about a year go. slowly, i've added blue items to my wardrobe. today, i went in to my current favorite store (COS, which is H&M's answer to banana republic) to have them remove the anti-theft device they forgot to remove from a necklace i bought the last time and there were new styles in the store. and frankly, i couldn't resist them. black isn't far from navy blue, but everyone needs a good little black dress and the cut of this dress? swoon! 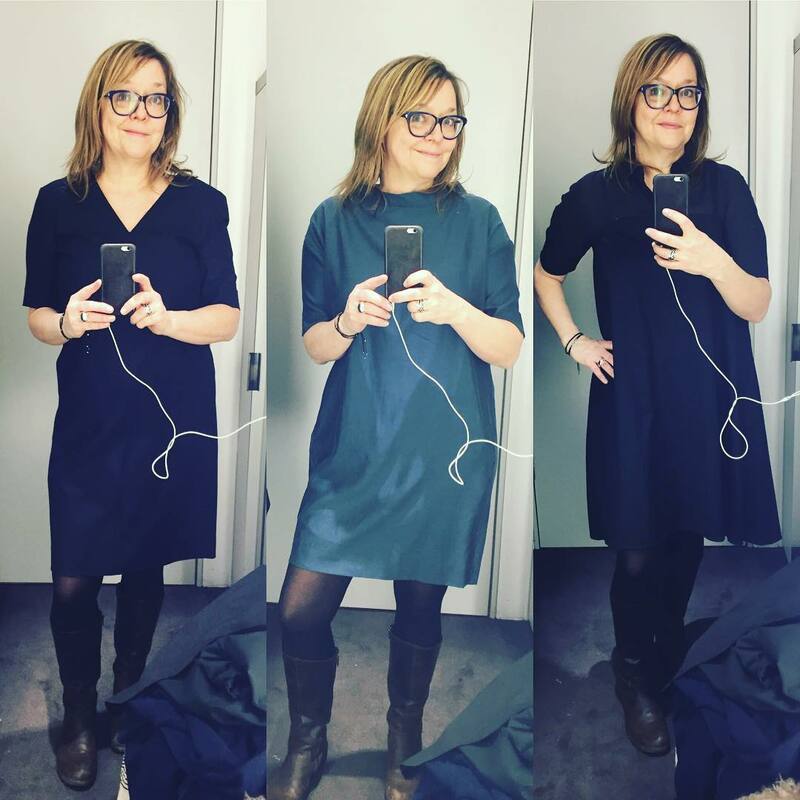 and to push myself out of the blue rut, i grabbed the mustard dress (those pockets are dark blue in reality, tho' they look black in this instagram photo, so there's still a bit of navy) and made myself try it. it didn't look like much on the hanger, but i fell in love with it. i didn't fall in love with the one in the middle, so it stayed in the store, but i did like the burgundy, pink and navy combo. i think best of all, i realize in looking at these photos, snapped in a dressing room mirror, that i look happy again. and feel worthy of pretty new clothes. it's been far too long since that happened. i think it might have something to do with all those ships. Labels: a new look, finding my way back to myself, i confess i'm happy, i don't look like who i am, i'm a ship geek, who am i anyway? You look great in all of them, it must have been hard to decide which to take and which to leave behind. And yes, you DO look happy!!!! You look gorgeous! You deserve them all! This reminds me of how I do not own a single dress. As professor I love my privilege to dress down. But I'm inspired now.